Irrigation is defined as artificial application of water to land or soil. Irrigation process can be used for the cultivation of agricultural crops during the span of inadequate rainfall and for maintaining landscapes. An automatic irrigation system does the operation of a system without requiring manual involvement of persons. 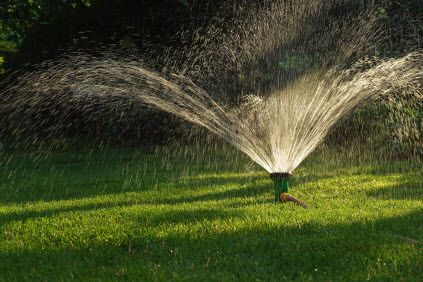 Every irrigation system such as drip, sprinkler and surface gets automated with the help of electronic appliances and detectors such as computer, timers, sensors and other mechanical devices. An automatic irrigation system does the work quite efficiently and with a positive impact on the place where it is installed. Once it is installed in the agricultural field, the water distribution to crops and nurseries becomes easy and doesn’t require any human support to perform the operations permanently. Sometimes automatic irrigation can also be performed by using mechanical appliances such as clay pots or bottle irrigation system. It’s very hard to implement irrigation systems because they are very expensive and complex in their design. By taking some basic points into considerations from experts’ support, we have implemented some projects on automatic irrigation system by using different technologies. In this article, we are describing about three types of irrigation systems that work automatically and each system is an advancement of the previous one as we go from first system to the next, and so on. The automatic irrigation system on sensing soil moisture project is intended for the development of an irrigation system that switches submersible pumps on or off by using relays to perform this action on sensing the moisture content of the soil. The main advantage of using this irrigation system is to reduce human interference and ensure proper irrigation. 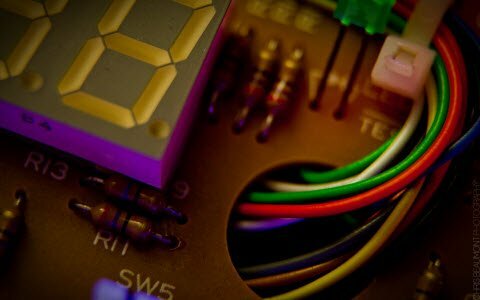 The Microcontroller acts as a major block of the entire project, and a power supply block is used for supplying power of 5V to the whole circuit with the help of a transformer, a bridge rectifier circuit and a voltage regulator. 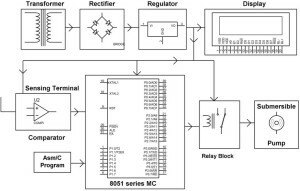 The 8051 microcontroller is programmed in such a way that it receives the input signal from the sensing material which consists of a comparator to know the varying conditions of the moisture in the soil. The OP-AMP which is used as comparator acts as an interface between the sensing material and the microcontroller for transferring the moisture conditions of the soil, viz.wetness, dryness, etc. 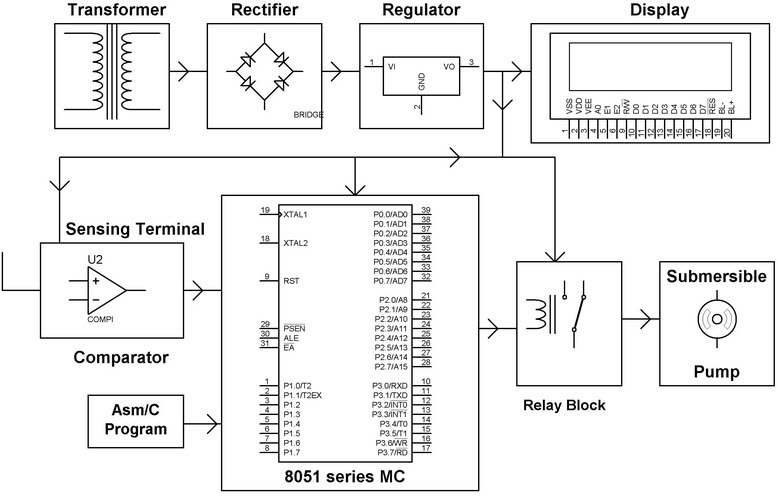 Once the microcontroller gets the data from the sensing material – it compares the data as programmed in a way, which generates output signals and activates the relays for operating the submersible pump. The sensing arrangement is done with the help of two stiff metallic rods that are inserted into the agricultural field at some distance. The required connections from these metallic rods are interfaced to the control unit for controlling the operations of the pump according to the soil moisture content. This automatic irrigation system can be further enhanced by using advanced technology that consumes solar energy from solar panels. 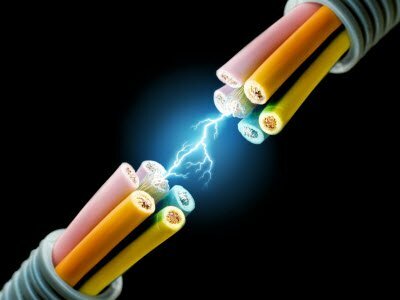 In the above figure, the power from utilities is required to operate the system. As an extension to the above discussed system, this system uses solar panels to power the circuit. In agricultural field, the proper usage of automatic irrigation method is very vital due to some shortcomings of the real world like scarcity of land reservoir water and scarcity of rainfall. The water level (the ground water table) is getting reduced due to continuous extraction of water from the ground and thus gradually resulting in water scarcity in the agricultural zones slowly turning them into barren lands. In the above irrigation system, solar energy generated from the solar panels is used for operating the irrigation pump. 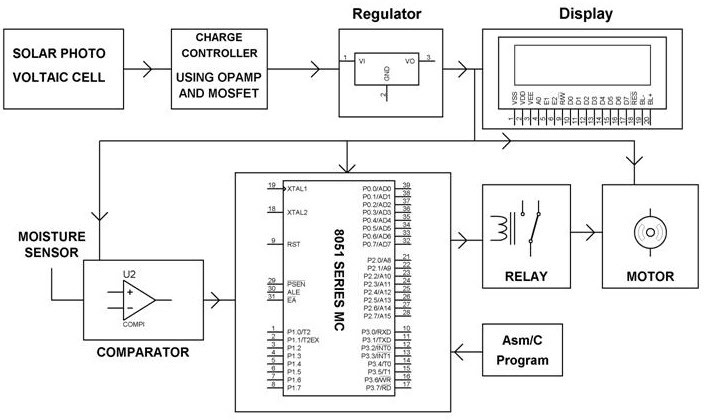 The circuit comprises moisture sensors built by using OP-AMP IC. The OP-AMP is used as comparators. Two stiff copper wires are inserted into the soil to know whether soil is wet or dry. 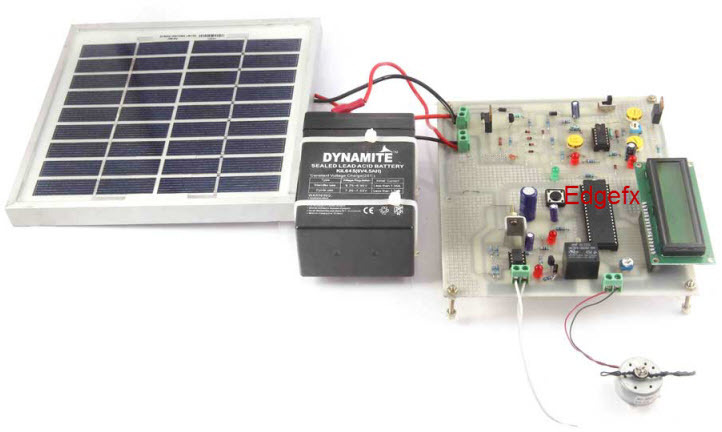 A charge controller circuit is used to charge the photovoltaic cells for supplying the solar energy to the whole circuit. A moisture sensor is used for sensing the soil condition – to know whether the soil is wet or dry, and the input signals are then sent to the 8051 microcontroller, which controls the whole circuit. 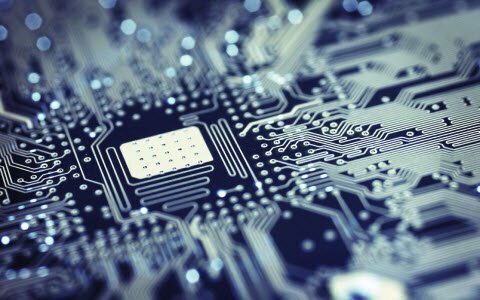 The microcontroller is programmed by using KEIL software. Whenever the soil condition is ‘dry’, the microcontroller sends commands to the relay driver and the motor gets switched on and supplies water to the field. And, if the soil gets wet, the motor gets switched off. 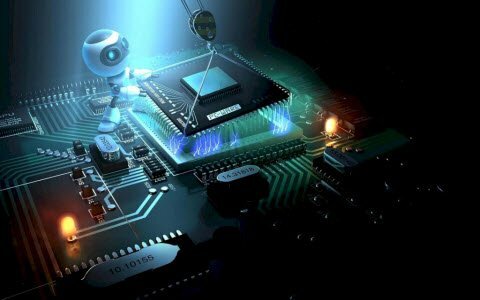 The signals that are sent from the sensors to the microcontroller through the output of the comparator operate under the control of a software program which is stored in the ROM of the microcontroller. The LCD displays the condition of the pump (on or off) interfaced to the microcontroller. This automatic irrigation system can be further enhanced by using GSM technology to gain control over the switching operation of the motor. Nowadays farmers are struggling hard in the agricultural fields round the clock. They do their field work in the morning section and irrigate their land during night time with intermittent intervals. The task of irrigating fields is becoming quite difficult for the farmers due to lack of regularity in their work and negligence on their part because sometimes they switch on the motor and then forget to switch off, which may lead to wastage of water. Similarly, they even forget to switch on the irrigation system, which again leads to damage to the crops. To overcome this problem, we have implemented a new technique by using GSM technology, which is explained below. The GSM Based automatic irrigation system is a project in which we get update status of the operation carried out in the agricultural fields via SMS with the help of a GSM modem. We can also add other systems such as LCD displays, web cam and other smart controlled devices. 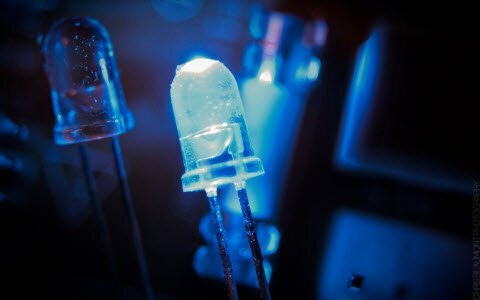 In this project, we are using LEDs for indication purpose. In this project, we are using soil moisture sensor which is used to sense the moisture level in the – to know whether it is dry or wet. The moisture sensor is interfaced with the microcontroller. 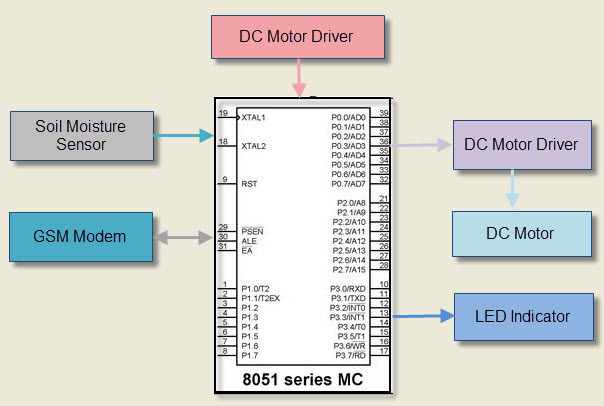 The input data signals from the moisture sensor are sent to the microcontroller and based on that it activates the DC Motor and switches the motor on with the help of a motor driver. After the soil gets wet, the Motor gets switched off automatically. The status of the agricultural fields can be known from the indication of the Light Emitting Diode (LED) or through the message sent to the GSM modem placed at the field. Simultaneously it is possible to send messages through a mobile to kit through the GSM modem. 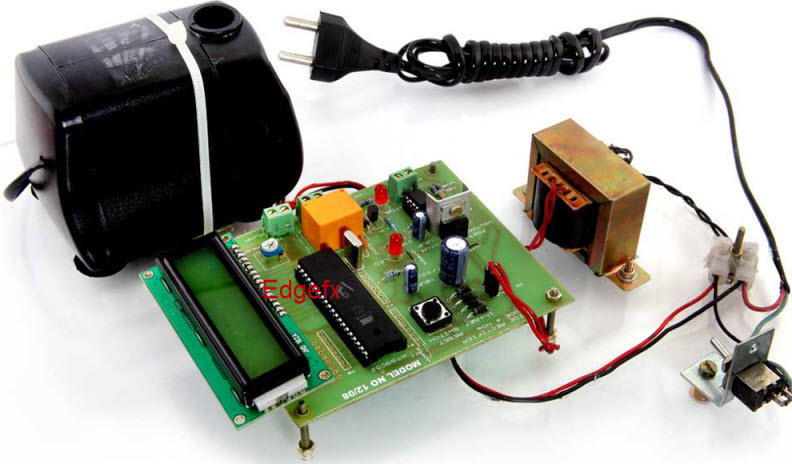 Thus, the irrigation motor can be controlled by using a mobile and a GSM modem. These are the three irrigation systems that use different technologies, which are useful for the persons working hard in agricultural fields. 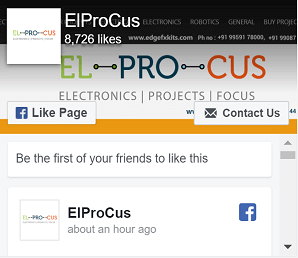 For any help regarding these projects, please feel free to visit our website Edgefxkits.com, and you can also comment below for any queries. soil moisture modules are available in the market. you can buy it for around 500 rupees. heloo sir i want code for 8051 micro controller working in “auto irrigation system using soil moisture sensor and (pic or 8051) microcontroller”. I needa full kit of water irrigation system for daily consumption of 50 to 100 ltr. water. i want to control this water flow intake control automatically, so please any body suggest me what should i do and which kit should be beneficial for me. please give me suggestion. We people are doing Our Final year project on the topic called Solar Panel Based Auto- Irrigation system using 8051 & By GSM..